The bells that provide a soundtrack to life-pealing in celebration, sounding a warning or tolling with muffled tongues in time of grief are more than mere instruments. Each has its own voice and name, from Batty Thomas in Dorothy L. Sayers’s The Nine Tailors to Elizabeth, the tenor bell of the Royal Jubilee Bells. All, like ships, are female. Since the Reformation, British bells have been hung in such a way as to allow them to rotate full circle and be ‘set’, poised motionless with mouths upwards, allowing for precise, complicated peals unique to this country. 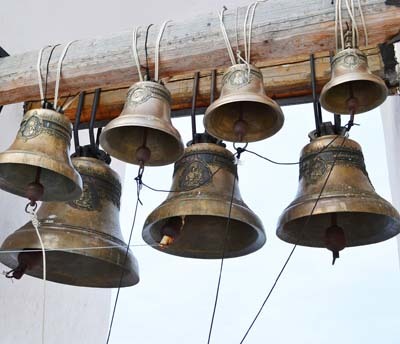 Change-ringing creates cascading notes known as rounds or methods (Plain Bob, Grandsire, Surprise Minor), mathematical permutations that allow each bell to give her fullest note. For ringers, the pleasure is twofold: the cerebral challenge of mastering the methods and the physical satisfaction of pulling in a team. Last year, a boat bearing eight new bells that rang for three hours and six minutes led the Diamond Jubilee Thames Pageant and thousands rang out to open the London Olympics. Now, more and more bellringers, from teenagers to octo-genarians, are feeling the ‘solemn intoxication that comes of intricate ritual faultlessly performed’, as experienced by Sayers’ Bach-loving hero Lord Peter Wimsey. For new ringers, the Learning the Ropes scheme with Discover Bell Ringing (www.bellringing.org) is the place to start. It includes five levels that cover bell handling, listening, rope-sight, understanding jargon and the theory of change ringing, plus a directory for finding teachers, history and notes on technique. The Central Council of Church Bell Ringers offers links to ringing societies across the UK and a list of Ringing Centres for newcomers (01279 726159; http://cccbr.org.uk). There are many local societies, such as the Oxford City Branch of Church Bell Ringers, which publishes a wealth of information about the history of bell-ringing on its website (01865 874026; www.oxfordcitybranch.org.uk). To find details of churches and their bells, Dove’s Guide to Church Bell Ringers (http://dove.cccbr.org.uk) contains the most comprehensive list, and, for those who want to teach, the Association of Ringing Teachers (www.ringingteachers.co.uk) runs the Integrated Teacher Training Scheme, with day courses around the country. Bellringing has been brought right up to date with a series of apps for mobile phones, which can be an excellent way to commit methods to memory. Discover Bell Ringing has a selection of the best (www.bellringing.org/apps), for iPhones and Android, including the Dove’s Guide dataset of 7,100 towers and TinTin Beginner Methods. Simply listening to a peal of bells is the best inspir-ation, but if you’d like to do more, all you have to do is ask. Any tower with an active group holds regular practice sessions at which new members are welcome. For example, St James Garlickhythe, London EC4 (020-7329 3632; http://stjamesgarlickhythe.org), home of the Royal Jubilee Bells, holds rehearsals every Thursday. Some churches hold open nights for new bellringers, and Worcester Cathedral (right) has a teaching centre with eight simulated bells (01905 732900; http://worcesterbells.co.uk). Beginners can learn about ringing history, watch the experts and take a turn at St Mary’s Church, Brecon (01874 749092; www.gooddayout.co.uk). Peal of eight handbells with 12F bass bell, £2,090, Whitechapel Bell Foundry (020-7247 2599; www. Make the converted granary at pretty Church Farm your base for a bellringing break in the Forest of Dean. When dusk falls, you can make your way to any of the 12 church towers in the area to ring with the regulars. Each has its own special character, from St Mary’s in Ross-on-Wye to St Lawrence at Weston-under-Penyard, but all offer a warm welcome. Accommodation is self-catering, but you’ll find a hamper of treats on your arrival. A three-night stay costs from £211 per couple. The grandfather of ringing courses, this has been run by the Moreton family since 1963 and is open to those in a tower group. There are generally more helpers on hand than students. Theory sessions are mixed with practicals, and a trip to Hereford Cathedral’s remarkable belfry is a highlight. You’ll stay at the Royal National College for the Blind. The next course is on April 24-27, and costs from £255 per person. * It takes practice to get the rhythm right, but as it’s a team activity, everyone tries to help each other. And when it does come right, the glorious and very public sounds produced are hugely satisfying. But be warned-bellringing is addictive!